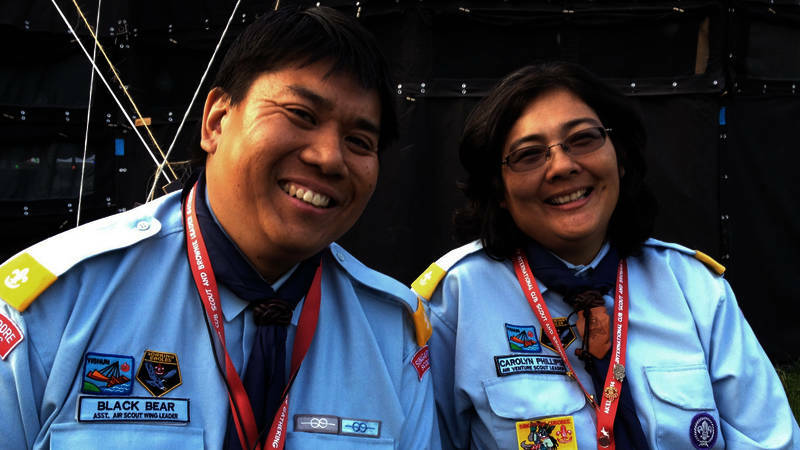 We are talking with Edgar and Carol, Cub Scout leaders from Singapore. The Cub Scouts section generally is in a good shape. Due historical reasons the structure of Scouting is similar to Scouting in the UK. A special challenge for scouts in Singapore is the decline of membership numbers in the older age sections. Engagement of the youth of today. Introduction of new badges. Having good cub scout leaders, teachers as leaders. Training in the scouting method. Complementation of school and scouting program. The Jungle Book as framing story. Refocusing on the Jungle Book. Attract the youth to join scouting. Training of leaders. Moving on of Cub Scouts to become scouts. Membership retaining. Cub Scout leaders are mainly teachers. Losing of members at transition to scouting sections is a serious issue in Singapore. Exchange on international level for Cub Scout leaders. Motivation to be on the Akela2014 event. Sharing with other leaders, sharing and exchanging ideas, starting cooperations. More pulicity of the Akela2014 event is neccessary. Improvement is possible. Engagement of the youth, start were the youth is, listen to what they want, how to do scouting, in a way young members benefit. Electronic logbooks accepted as part of the assesment. Cub Scouts nowadays are digital natives. Try to move with the times, making scouting relevant. Doing Scouting in a way which is appealing to young people of today. Still waiting to see results.